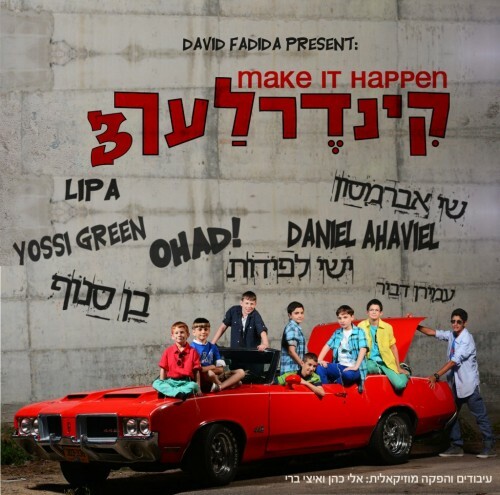 @splashnewsusa -The Kinderlach are back with their third album called “Make It Happen”. This album, produced by David Fadida, is a thriller for all techno lovers! To describe the album in one word- “Fun”. Every song, fast or slow, is just fun to listen to. This CD is really a step up from the first two which is something we always look for but we are not always rewarded. The reason for this is that there are many really solid melody’s including hit fast techno melody’s. I find that techno songs are often fun to listen to for a couple times and then it’s on to the next album. Not so with the Kinderlach. These songs are solid songs that you will keep on your playlists for a while. I am also impressed that the Kinderlach have managed to retain from album to album, their unique, almost falsetto sounding voices which is something I really enjoy. Of course the Kinderlach are not all about techno and they always have a nice collection of oldies but goodies. These two very different genres combined make for a very exciting album. I’m sure kids will be running after this one! Here is my take on the songs. 1. Pirchei Medley-The album starts off with the oldies in acapella style at least for the intro until the freilich low part. They are then joined by the powerful voice of Ohad. This song can be enjoyed by listeners of all ages. Great choice of songs. 2. Bat Melech- This is a beautiful slow song featuring Ben Snuf, who is not so well known in the States but is really something special. He really adds a lot to this track. He comes in at 2:11 singing softly to a slow electric beat and really brings out the beauty of the song. 3. Make It Happen- Hold on to your seats for the title track. This song is awesome. The Hebrew and English lyrics combine make this techno song really something different. My favorite solo is the thin voice at 1:14 “v’al tishkach et zeh…”. Pop star LIPA joins at 1:52 to spice this thing up. My only criticism is that although Lipa is the most talented singer I know of, his specialty is definitely not rapping in English. Yiddish is obviously his first language and he is unbelievable at that. The Kinderlach transpose at 2:15 and combine vocals with Lipa for a nice finish. 4. Hamalach Hagoel- This song features composer Yossi Green. It is a swing style and very fun song. This track is right up Yossi’s alley. 5. Adif Lishtok- A medium paced techno style song with a very laid back feel. Perfect for the beach or just a great chilling song. We get the trademark Kinderlach rap at 2:02. This is one of my favorites. 6. Chemdat Lavavi- Want something different? This track is for you. Featuring chazzan Shay Abramson, this song has a distinct Sefardic feel to it. This song also has a laid back feel to it. Good stuff. 7. Shema Hashem– This is a stunning slow song done in electric style. I have to argue that this melody would sound a lot nicer with regular acoustic arrangements but that’s my opinion. I do like that the arrangements are not over done. They leave room for the the vocals to really define the melody. My highlight is when the beat breaks off at 3:43 befor the ending. 8. Ein Od Milvado- This song could have easily been the title track. It is a thumping, rocking, techno song with a great high and low. The nice slow bridge at 1:25 gives way for the song to really kick at 2:25. Possibly my favorite song. 9. Ana Melech- After the exciting intro I was not expecting that Ana Melech from MBD! But this is really a whole new Ana Melech with these reggae arrangements. This is a really cool song. Although it’s an old song, I highly recommend it which not something I will often do. 10. Modeh Ani- This song was put out as a single before Pesach. This is a heavy duty techno song featuring Yishai Lapidot. If I was writing the song, I would have checked the proper English before recording it (always you say modeh ani). Hey, let’s not mess with Israeli’s! 11. Chamisha Kolot- Another serious electric song. It’s not often that I have 3 favorite songs on an album but this song is right up there with Ein Od Milvado and Make It Happen. This song features the aewsome vocals of Amiran Dvir. A simple review won’t do justice to this song. You gotta hear it. 12. Avichem Shebashamaim- Another MBD song. This is completely a remix with very little vocals. This can make for a great Breslov jumping on vans style song. Now that is a great genre! Oh, and Daniel Ahaviel does his thing on the violin. Yes, in a techno song. Summing it up, this is by far the best we have seen from the Kinderlach and I highly recommend this album to kids choir and techno lovers. This is also sure to be a younger generation favorite if you know what I mean. Question: Do you guys ever not like an album? Rachel, that is a great and valid question. I am one of the moderators of this website, and I just wanted to explain that it’s not the policy of this website to review albums that the writers who volunteer their time don’t like. Therefore they will only write about albums that they like or that has songs that they like. Of course you can also gauge a level of excitement from a writer if they just like the album or song, as opposed to a writer who LOVES LOVES an album. I think also sometimes (not all times) if something is not written about that might hint at something. Or, it could just be the writer hasn’t had time yet to compose their thoughts.